The album amicorum as gadget. In the sixteenth century many scholars and students had a hobby as learned as sympathetic. They kept an album amicorum or friends book. They invited appreciated persons, professors or fellow students, friends or relatives, to contribute a poem, a sentence or a drawing. Preferably a combination of those. In this way a lifetime memory was assured of friends and times gone. The Leiden printer Jacob Marcus thought to have discovered a gap in the market. A prefab friends book, interleaved with blank pages for individual contributions, but in between pictures of Leiden and every day Holland, to keep alive the memory of the golden period of study in Leiden. Between the images there are of course pictures of the University, but also images of the town and vistas in The Hague and Amsterdam. In addition the book contains a variety of illustrations typical of Holland: peat digging, a hemp farm (! 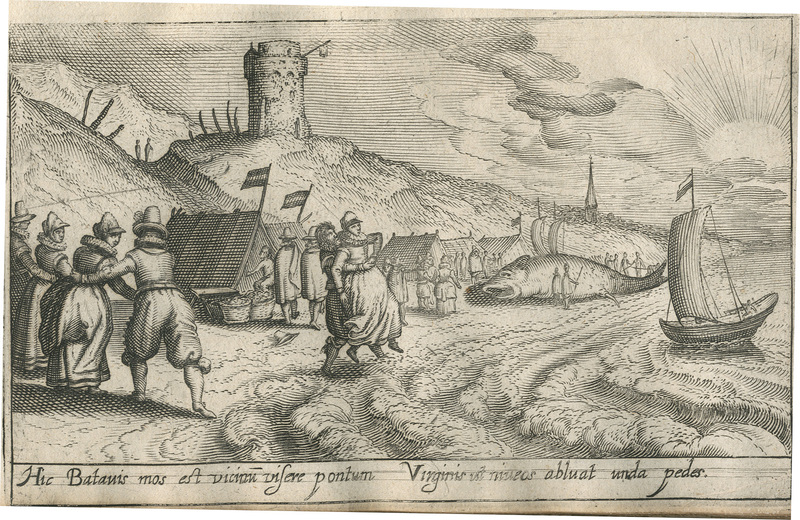 ), youngsters threatening to bear girls into the sea, ice sailing, the sailing car of Simon Stevin on the beach, the dairy farm, the ship building. Industrious folks, those Dutch. Of this album, with the sweet title Deliciae Batavicae, Leiden University Library recently obtained the so far most complete specimen. Each copy of this rare edition is in fact different in composition. Undoubtedly images have been cut out and given away. On the other hand illustrations could be added. One of the former owners of the album presented here (shelfmark 20651 E 17), has added portraits of professors from the same period: in this way he not only kept a memory of Leiden town and university, but also of the scholars. The oldest and most complete edition the University Library now possesses, deviates in parts from an other, far less complete one. High time to get started and to compare and describe attentively all remaining copies traceable.